The future political, economic and even cultural conditions of our world seem to be quite vague, particularly since the time the bipolar order of the world changed to the new global structure. The ambiguity is most serious with respect to economic conditions, as events during the past decade have revealed that the capital and assets of large companies no longer ensure the survival of such economic entities. Many large companies have gone bankrupt and many have merged with other companies just to survive. But naturally so, those corporate entities that have the appropriate infrastructures can better endure in these harsh times. One such company in Iran today, as the trends of the past few decades, particularly the last, and the progress made by it during this time indicate, is Iran Khodro. It has grown from a relatively small company to one that has 50,000 employees: workers, engineers, technicians and headquarters personnel with a capital of six billion dollars. It produces 520,000 cars and 25,000 commercial vehicles of various sorts and lies at the heart of a cluster of 1200 part manufacturers. The design of the gas-consuming internal combustion engine was first approved in 2001 in a meeting in which Mr Aref, the First Deputy to the President, and Dr (Ms) Ebtekar, the Head of the Environmental Protection Organization and representatives from various ministries and organs participated. It took almost two years of hard work to develop the engine, and the major aim of all these efforts was to produce an engine of highest possible power using natural gas as its preferred fuel, gas being both abundant in Iran and therefore cheap; and clean. The first engine made in Iran has 16 valves and 1.7 liters capacity, and will be installed in cars soon. This is a serious step towards making the Iranian auto industry independent of foreign manufacturers and self-reliant and ultimately self-sufficient. The engine will be one of the most advanced engines worldwide. The new engine should also help promote mastery of engine design in Iran, and lead to a far cleaner air in the crowded cities of the country and a great deal of savings through reduction in consumption of costly gasoline. It has already had remarkable effects on the industry, notably in the promotion of team-work in the design and R&D departments of manufacturers that have cooperated in its development. The New Product Development Center of Iran Khodro is the brain of the Iranian auto industry. It acts as a brain by researching and thus providing new ideas, and a constant flow of innovations. The latest item offered to the public by this center is the design of the new Sarir in the Samand range: it is a more advanced model of Samand, which originates in the Peugeot 405 limousine. After the production of the National Car and then the National Engine, Iran Khodro now aims at developing Iran's National Bus. This will be done by Iran Khodro Diesel Co, a subsidiary of Iran Khodro, which presently produces 25,000 vehicles - among which 6,000 gas-based or diesel buses - a year. It also produces all the engines, gearboxes, axles and most of the other parts it requires for its buses, according to German Mercedes Benz standards. The company's other products are minibuses, vans, trucks, and ambulances. Like any reputable auto manufacturer, Iran Khodro gives first priority to quality, and continual quality improvement. Towards this end its new assembly lines are all equipped with robotic systems, to press, build bodies, paint, assemble them etc. About 600 robots are installed and operate in Iran Khodro's production halls. With these new facilities and effective quality management - and management in general - Iran Khodro has managed to increase production by a remarkable number while improving quality to a remarkable degree. The Peugeot 206 Iran Khodro produces occupies the first rank for quality among all the six countries that produce this model; and Peugeot France admits this fact. Iran Khodro exports vehicles of various sorts to 32 countries, and has the potentials to expand its exports considerably. Recent marketing studies reveal that 48 countries can be export targets for Iran Khodro. Presently, the Samand model is to be assembled in Syria, Venezuela, and Senegal. Furthermore, studies reveal that by the end of 2010 Iran Khodro will be exporting 12-15% of its production. From early 2005 Iran Khodro has been preparing itself for the year 2020 under the banner of "Iran Khodro 1400" (the Iranian calendar year which coincides more or less with 2020 Gregorian Calendar). By then, Iran Khodro intends to be strongly and widely established in the world market, supplying a good part of the world market demand. It also intends to join the worldwide network of R&D both in the industry and in universities and other scientific centers of reputation worldwide. 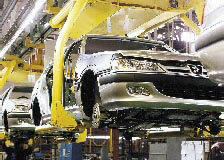 Another objective of Iran Khodro is the expansion of exports of auto parts of all kinds. But of course this will not be possible without great improvement in quality and large reductions in costs.